The ongoing blockchain governance debate got even more heated over the last few days. 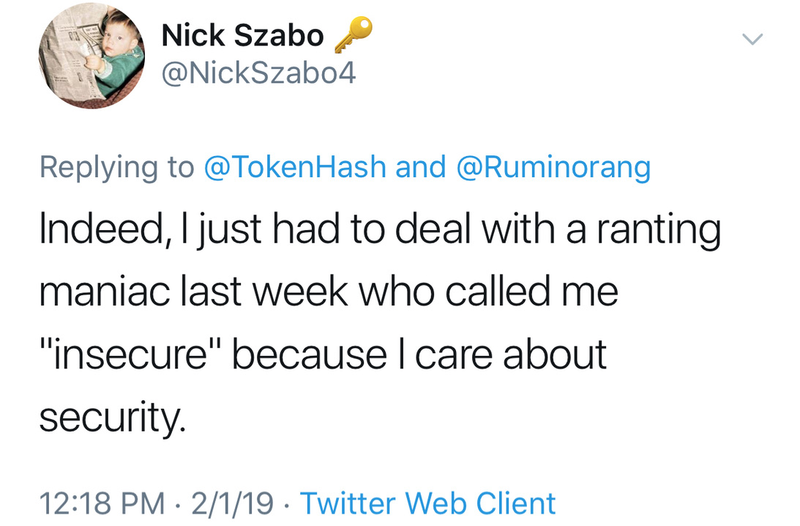 Vlad Zamfir took it upon himself to deliver the news the entire crypto community should have realized since the start, but for whatever reason has been afraid to articulate: Nick Szabo’s crypto law/governance vision is a theoretical dead end. We’ll let you decide who is stupid or smart in this debate. But only after you engage with the ideas in good faith. Other primary sources include the Ethereum Yellowpaper, the Bitcoin Whitepaper, and CryptoLaw conceptual chain audits like this one, or this one, or this one. In addition to the primary sources, there are also several valuable responses to Zamfir. Some are valuable for their analytical rigor, some are valuable for contrast. These include strong objective overviews, like this one by Rebekah Devine. Here’s one way to read Vlad’s argument. There are basically three categories of “Laws” that structure and inform the crypto space: (1) the blockchain protocol; (2) law; (3) immutabilist ideology masquerading as principled law-and-econ and rights-based argumentation, but which is actually hollow politics-as-law (what Zamfir calls “Szabo’s law”). Here is Zamfir’s taxonomy for these three branches, along with several alternative versions for context. Please note, (A + B - C) ≠ A + B for two principal reasons: (i) operation of time, which means A, B, C are never fixed concepts to begin with; (ii) clones of C (say, D, E, F … ) vie to replace C, which means every subsequent A + B - C framework will inevitably include clones and ghosts of C.
Keeping the clones and ghosts in mind, the new crypto legal system proposed by Zamfir likely resembles A + B + c, instead of A + B + C. Minimizing C (“Szabo’s law”) maximizes the freedom of action of future blockchain governance stakeholders. Zamfir clearly explains how and why C contravenes A + B. 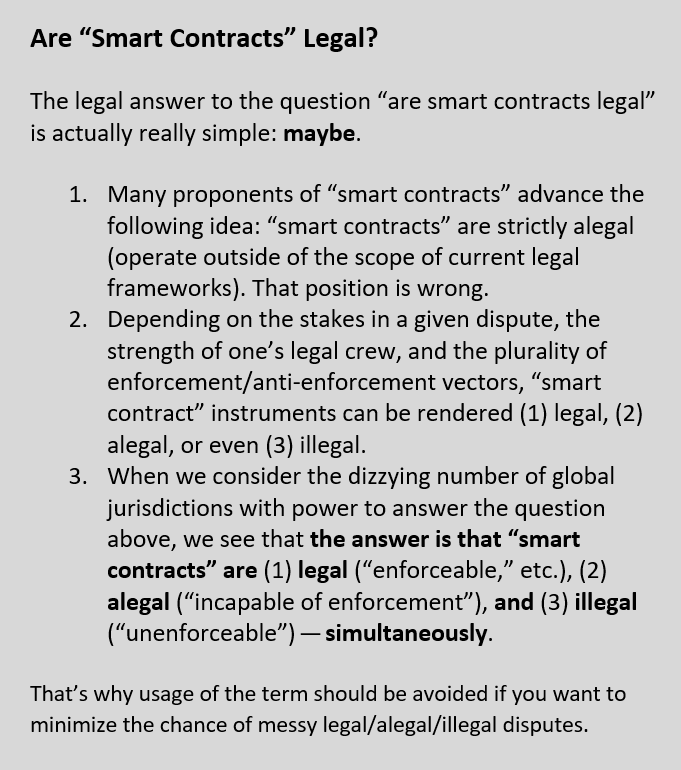 If you need more concrete proof, here is a similar argument in the context of “smart contracts.” Here’s a related, though broader, argument in the context of contract rights and enforceability. Here’s the basic idea. In order to reap the supposed gains of immutability in a hyper-legal operating environment, Szabo & Co. are forced to argue that blockchains like Bitcoin/Ethereum (and core crypto instruments like BTC/ETH) are alegal instruments. But that position is doctrinally and prudentially unsound. In the crypto context, alegality claims manifest as anti-legal postures. Zamfir is not calling for new legislation, new regulation, or new case law for crypto. Instead, Zamfir’s call for a new “crypto legal system” is a call for better legal thinking towards minimization of needless conflicts with legacy legal systems. The key requirements for Zamfir’s new “crypto legal system” seem to be: (1) transcending crypto’s unnecessary, distracting, and costly alegality fetish; (2) acknowledging that individual and institutional pulls towards legality are, pragmatically, the most secure blockchain development pathways available today. Zamfir realizes that crypto’s alegality postures are actually much closer to illegality postures than to legality postures. Zamfir suggests that embracing legality today is the most secure way to incubate new and improved alegality and legality frameworks for tomorrow. And new ones are needed because existing frameworks have only lead to conflicts. Theoretically and politically, Zamfir’s argument for (A + B - C) is not “Leftist” or “Statist” or “Interventionist.” Instead, Zamfir’s view reflects a basic realist understanding that blockchains are already legal + illegal + alegal simultaneously. And when C claims that a given blockchain process is alegal, it contradicts A + B. This raises the likelihood of more regulation to clarify C’s status vis-a-vis A + B, and raises the likelihood the underlying blockchain process gets outlawed in the jurisdictions that are scratching their heads over crypto’s C posture. Another clear example of a type of conflict between Law and “Szabo’s law” is the basic idea of states’ jurisdictional reach over crypto. By now, however, everyone should see that claiming supra-jurisdictional status is tantamount to a denial of states’ jurisdictional reach and/or prerogative. Everyone should also see that the logical way for states to respond to industries and projects that defy jurisdictional reach is via a strong assertion of jurisdictional reach. Key takeaway: supposed non-interventionism (“Szabo’s law”) actually invites interventionism. As a posture, C is also incredibly fragile because it overtly challenges the status quo without offering novel utility or any meaningful protections for blockchain stakeholders (beyond those scripted into a given C-approved protocol). Zamfir calls this an aggressive and insecure legal posture, and he is absolutely right. But Zamfir’s clear that he’s referring to particular theoretical-institutional postures, as opposed to any one person. But just to be safe, to avoid even the mere appearance of ad hominem argumentation, we can also assess “Szabo’s law” by reference to security standards advanced by Szabo. By Szabo’s own logic, claims of alegality are insecure because they broaden the legal attack surface. 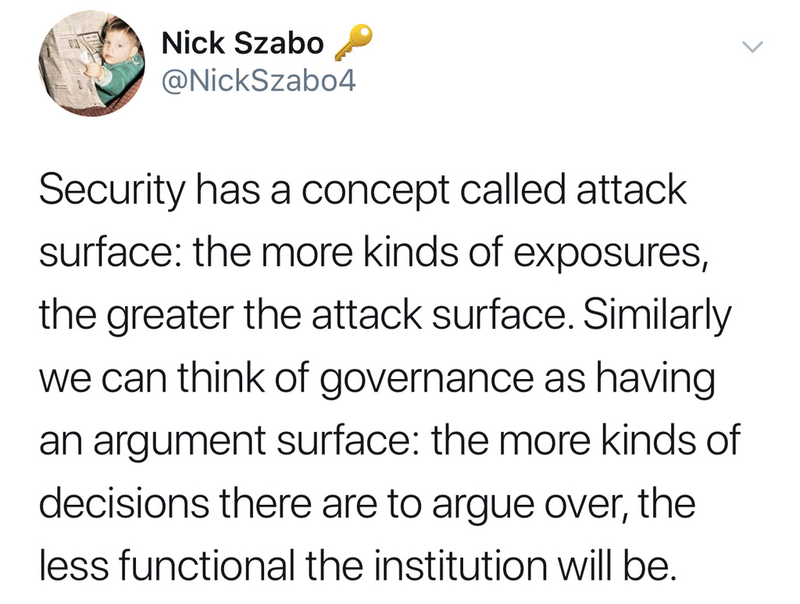 The first part of Szabo’s tweet reflects a general principle of process design, called attack surface minimization. (The second part of Szabo’s tweet is wrong, refuted by institutions like courts of general jurisdiction. These are institutions that anticipate an infinite range of disputes, decisions, and party permutations, yet are remarkably functional and durable). With attack surface minimization in mind, we should acknowledge that governance questions are always matters of degree and entail economic tradeoffs. Nevertheless, we can deduce guiding principles. One of them is that pursuit of purely-algorithmic blockchain security often comes at the cost of real-world utility. A general-purpose blockchain that is immutable by design essentially invites strong legal intervention, up to outright legal abolition. That is attack surface magnification, not attack surface minimization. When there’s ambiguity regarding whether a given crypto network, process, institution, etc. is legal, alegal, or illegal, every attempt to answer that question (by multiple actors, across multiple jurisdictions) results in greater operational uncertainty and higher transaction costs. There is absolutely nothing controversial or FUD-y about this statement. This is as close to settled fact as one gets in our socio-legal matrix. It is Szabo’s choice to embody the positions and postures ascribed to him, or to repudiate them. 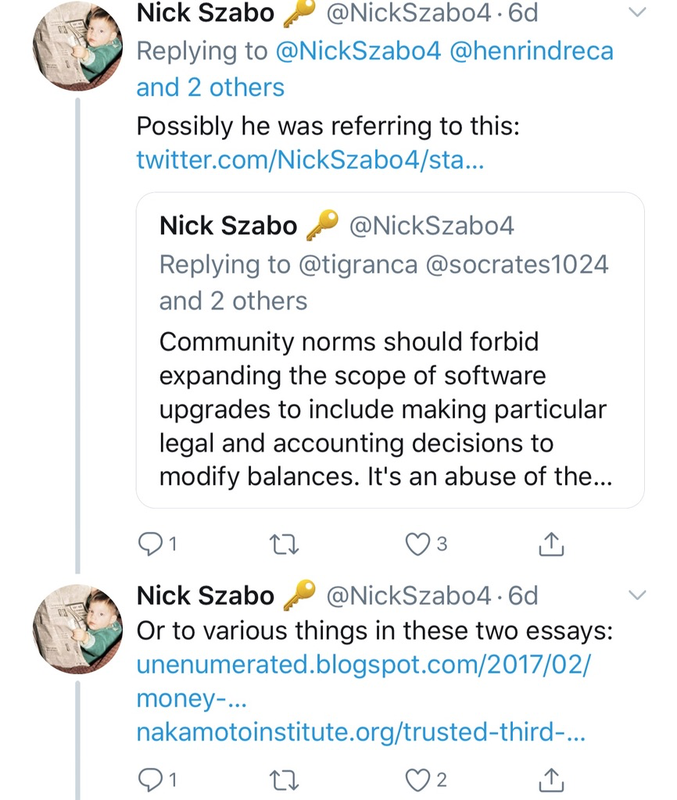 In responses to Zamfir’s critique, Szabo is clearly embracing — and definitely not repudiating — the characterization of his centrality to the evolution of CryptoLaw. In so doing, he affirms a core kernel of Zamfir’s intuition — that Szabo is actively pursuing a politics of exclusion and intellectual authoritarianism. But like most people, Szabo cannot resist the chance to validate his own views. So in the same thread, he writes. 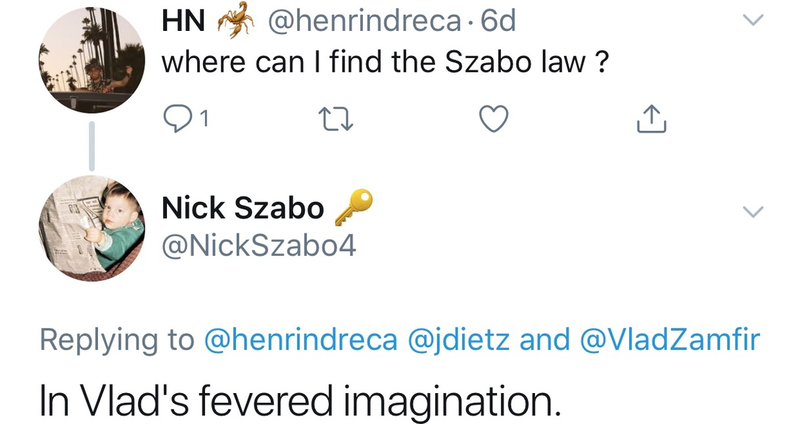 Translation: “Szabo’s law” is the product of Zamfir’s “fevered imagination,” as expressed on Szabo’s blog. We’ve now reached a fork in the debate. Adherents of “Szabo’s law” will continue their attempts to: (1) deny the validity of Zamfir’s critique; yet, simultaneously, (2) to appropriate the core critique, and re-market it as their own legal innovation. But they cannot do both. Although we reduced Zamfir’s ideas to disembodied A, B, and C, everyone can see these are placeholders for extremely complex socio-legal processes, with many competing individual agendas and interest groups. “C” has many clones who are elbowing to imprint their hands on the future of crypto law. Time (t) and other factors are also rapidly changing A, B, and C. But there is one relative constant amidst this rather fluid dynamic: you. Governance, “crypto law,” “contract,” aren’t just valuable socio-legal abstractions — they are, increasingly, our day-to-day interpersonal and commercial background norms. These norms govern real flesh-and-blood people and real-life institutions. This is not just some “three-actor game.” This is real life, and you are the central actor. The fight over CryptoLaw determines who shapes the future. Zamfir’s view is that you are a key stakeholder in ongoing blockchain governance debates; hence, you are the one who should be shaping your crypto-legal strategy to reflect your values. Zamfir’s critics believe you should just leave it to the professional lawyers — the ones who got crypto into its current mess. Whom do you trust more?